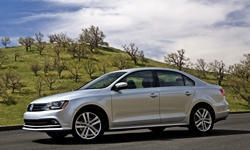 Volkswagen Jetta Pros and Cons | Page 1 of 6 | Why Not This Car? What drives people to buy (or not buy) a certain car? TrueDelta's members share Volkswagen Jetta pros and cons based on their real-world driving experiences. Everything is well placed and the seats and steering wheel adjust very well to accomodate almost anyone. Cannot go wrong with this car. Fuel economy is A1, handling is fine, fit and finish are great, solid feeling and a proven technology that I hope will result in me owning and driving this car for at least another 10 years. 140 TDI engine offers great amount of fun. The transmission shifts smoothly from first to sixth, all the while providing a very potent 240 lb/ft of torque. Very entertaining, doesn't disappoint until you reach higher speeds on the highway (until you downshift anyway). I should've kept my Focus. More dependable and better mpg. Love the Tiptronic transmission. One of the main reasons I got the car. Shop around for a good price. Quality is good, some complain about interior look. If your like it the the rest is GREAT. The style is unique without being dated or odd. The body lines are straightforward, with the lighting being modern and functional without excessive styling cues. Platinum grey color looks good and seems to help the lines of the design flow together. Seat is low, lack of adjustability, no lumbar support, difficult to adjust; left arm can not rest on the arm rest while driving without putting a pillow there for support, nor right arm rest available. Things are where they are meant to be.